Russian Federal Security Service chief Alexander Bortnikov announced today that Russian passenger jet Flight A321 was blown up by homemade explosive device equivalent up to one kg of TNT. "It can be unambiguously said that this is a terrorist act," Bortnikov said. "In the estimates of our specialists, a self-made explosive device with its power of up to 1 kilogram in TNT equivalent went off aboard the airliner, due to which the plane broke up in the air and this explains the spread of the plane's fuselage parts over a large distance," the Federal Security Service chief said. The FSB takes measures to find those involved in the terrorist attack on board the Russian airliner in Sinai, the service’s public relations center told TASS. "FSB and law enforcement agencies of the Russian Federation are taking measures to detect the people involved in the crime," it said. 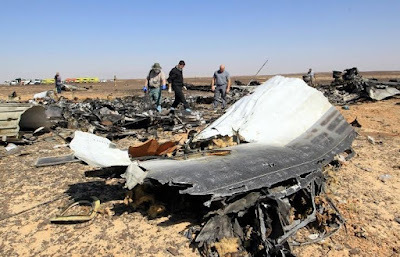 The Federal Security Service appeals to the Russian and the international community for assistance in search for the terrorists and has declared a $50-mln reward for information about those responsible for the plane crash. "For providing evidence that will contribute to the detention of criminals a reward of $50 million will be paid," the FSB’s public relations department said.